My name is Heath Smith, Lead Game Designer on Shadow of the Tomb Raider. I'd like to illuminate how and why we came up with Shadow's customizable difficulty settings - individual settings for not just combat, but exploration' and puzzles as well. The first reason for separating the difficulty levels? To honor the fact that players would be spending an equal amount of time playing each one. From the earliest days in the development, we knew we wanted this to be the most balanced Tomb Raider of the survivor trilogy. Our goal was that each of the game's pillars - combat, exploration and puzzles - should have as equal play time as possible, especially on the main path. With Shadow, we knew we wanted Lara to feel the most capable she ever has. That meant increasing her challenge socially (through having Lara talk with the locals), intellectually (through more and harder puzzles) and in traversal (deadlier traps). Our goal was that, by the end of the game, she would become a new interpretation of the classic Tomb Raider. This also aligned with the feedback we'd received from the community that, for some, Tomb Raider had become too combat-focussed. Rather than remove combat, we increased the amount and variety of the other two pillars - hopefully creating a more balanced gameplay experience, and mirroring Lara's growth into a more intellectual, strategic person. The second reason was equally important to us. This was the third game of the origin trilogy. As Lara has grown more capable, so have players - not only did we need to up the challenge for Lara by dumping her into the jungle with new threats, we needed a new layer of challenge for players familiar with the series. 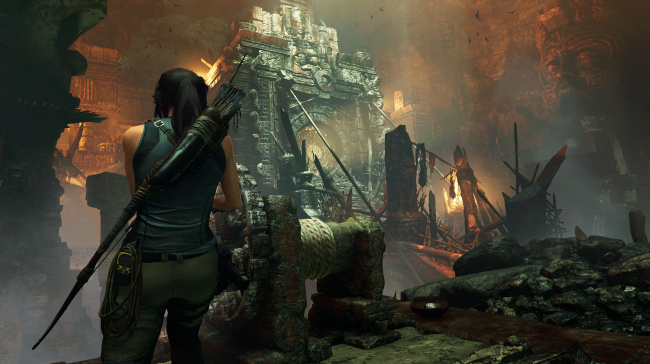 We wanted to make this the hardest Tomb Raider! Our playtests confirmed that players were hungry for more challenge across all pillars. For exploration, we also know from playtests and the community that players were eager to play the game without the white markings suggesting the next ledge to climb on. There was even a thread on the forums called 'GROWL' (Get Rid Of White Ledges) dedicated to this topic! Linking the visibility of white markings to difficulty was received well and an early indicator that we were on the right track. For puzzles, we would often design a hard puzzle, and while some players would find the amount and directness of Lara's hints just right, there would always be some who would be frustrated when Lara would give away the solution when they used Survival Instincts to see their options. Some players wanted to be stuck in puzzles. The solution, as the best ones usually are, was the simplest. Allow them to choose exactly how much hand-holding they would like. This even satisfied a third segment of players that we observed in playtests: players who were really not puzzle fans, and would press a "skip puzzle" button if they could. We created the easy puzzle setting for them. Highlighting the next puzzle ingredient in Survival Instincts and having Lara pretty much spell out what they need to do was our version of the "skip puzzle" button. The third reason to split the difficulty levels was that it allowed us to create even more challenging combat,. We put a lot of work into new AI and mechanics - enemy detection systems, search behaviours, stealth tools and numerous ingredients such as vine walls and canopy traversal - all with the goal of encouraging players to plan, strike and disappear. "Hard" mode was our way to ensure players explored those systems. For example, if there are ammunition boxes everywhere, the game is telling you "use assault, there will always be ammo!" By making them scarcer on harder difficulty levels, players must not only engage more in the stealth loop, but investigate the new "stun" and "fear" tools they can craft. 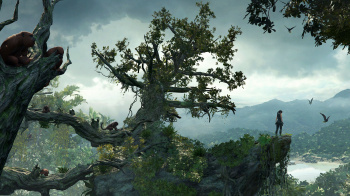 Disabling Survival Instincts for enemies by default makes players feel the occlusion of the jungle environments until they are empowered by using the new "Perception" ability to sense enemies through the environment. Disabling health regeneration on harder difficulties encourages players to actively engage with herbal remedies. Every time you heal, you see the other remedies on offer, reminding players that healing can now be strategic as well. These were the three main reasons we separated the difficulty levels. But, as is always the case, other benefits that you can't fully anticipate come to light afterwards. We started to get feedback from playtests that players playing on ard were more immersed in the world and felt more connected to Lara. While we somewhat anticipated this with the white markings change, other new settings had a similar effect. For example, when enemy detection meters weren't there, players listened more to enemies' voices for feedback. And while we didn't specifically create the new difficulty settings for accessibility reasons, some of them were called out as potentially helping in this regard (e.g. making white markings more visible). These are the main reasons we split the difficulty levels. While it might not be right for every game, we felt it was right for us. We hope you enjoy the conclusion to Lara's origin story, no matter what combination of difficulty settings you are playing on!